Part of that project was to make it more portable and make it available on other platforms. I have a preliminary iOS build of it, as well as a QT-based desktop build of it checked in which builds on Mac, Windows and Linux. Source at github will build for all of these, if you have QT Creator installed (along with support compilers for your system of course.) Binaries will be available eventually for all platforms. In the above screenshot you can see some 6502 asm in the center window. I have a makefile which uses the industry(homebrew) standard(?) 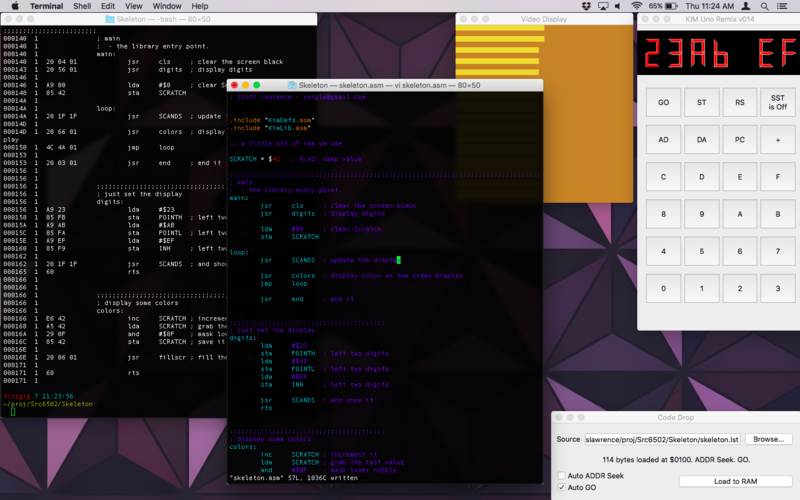 cc65 compiler/assembler to assemble it into a .lst "listing file". This file contains the original ASM as well as the machine language bytes and the addresses they sit at. This is a lot better, imo for distribution as it can be easily trimmed (ref: unix 'cut') to the original asm, or it provides the necessary information to hand-enter it into a KIM. The KIM Uno emulator can be seen on the leftmost window. It looks like you'd expect a KIM on a desktop to look. There are two other windows here though. The Video Display shows a virtual framebuffer which sits in KIM memory at $4000 (0x4000). It is 32x32 pixels, one byte per pixel. Only the bottom nibble is currently used in the byte, to signify one of 16 colors ($00, $01... $0E, $0F). At compile time you can use the Commodore 64 palette, or the Amiga palette, which is based on the default colors from Deluxe Paint. This feature is heavily influenced (copied/borrowed) from the very awesome virtual machine/programming interface available at 6502asm.com. Theirs sits at $0200, which collides with KIM stuff, so I moved it to $4000. Otherwise it behaves the same. The window in the bottom right is for a feature I call "Code Drop". You can take one of the .lst files mentioned above (generate one by running "ca65 project.asm -l project.lst") and drag and drop it to that window. Or you can click "Browse..." and pick it from your filesystem. Now, when you hit "Load to RAM", it will load in that .lst file, and drop the bytes in the appropriate place in RAM, while the emulation is still running. The "Auto ADDR seek" feature will then auto type-in for you the first address specified in the LST. The "Auto GO" feature will do the seek, then press "GO" for you as well. The application is also sensitive to the SIGUSR1 signal, which does the same as pressing the "Load To RAM" button. The desktop application is set to the appropriate .lst file for the project I'm working on. It is set for "auto GO" as seen above. Now in the makefile for the project, it will build the .lst file, then send the SIGUSR1 signal to the application. When I type 'make', it assembles the file, builds the lst, then triggers the emulator to reload and restart the code, essentially integrating it into my build process.